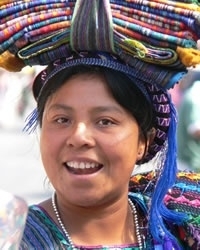 Cakchiquel, also known as Kaqchikel, are Mayan people of the midwestern highlands of Guatemala. They are closely related linguistically and culturally to the neighbouring Quiche, Central and Tzutujil. In their homeland, they are agriculturalists, and their culture and religion is a mixture and fusion of Spanish culture and Roman Catholicism with their traditional Mayan religion and customs. Their sharing of a common language does not provide a basis for ethnic identification among the Kaqchikel; the Indians themselves, like other Mayan peoples of the region, are organized into municipios (“municipalities”), and the people identify themselves with their own municipio. Each community usually speaks its own dialect of Kaqchikel, which is mutually intelligible with other dialects of Kaqchikel and is partly intelligible with K’iche’ and Tz’utujil. Each community also has its own political and religious hierarchy, local costume, patron saints, and economic specialty. Often, marriage to someone outside the municipio is considered improper. Many Cakchiquel immigrated to the USA during Guatemala's Civil War to escape the widespread violence against indigenous peoples. Now, many are continuing to migrate in search of economic opportunity. Initial Cakchiquel migration was primarily to Indiantown, FL, which became seen as a refuge for a wide mixture of Guatemalan Mayan groups. Now, many are spreading out around the USA in search of jobs. Pray for Cakchiquel believers to boldly proclaim the gospel to their people. Pray for more workers for the harvest, both for the Cakchiquel in the United States, as well as those in Guatemala and Mexico.